Cacti are succulent plants that store water internally. Cacti are drought-tolerant, and survive on infrequent rain water. There is little to no need for supplemental watering. A common trait among cacti of different species is their spiny or prickly exterior. Cacti have these protective needles to protect them from hungry or thirsty animals. Some cacti produce flowers, giving them bursts of color. 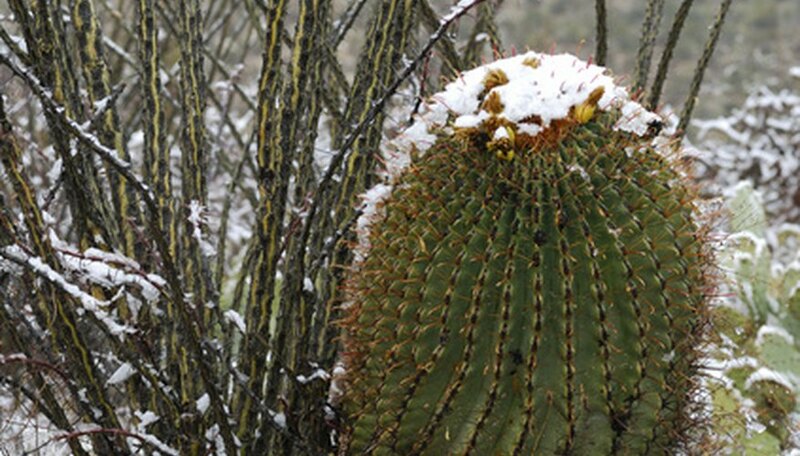 Barrel cacti grow in desert conditions of North America. The plants are found in California, Arizona, Texas and Mexico. Barrel cacti are cylindrical, and grow up to 10 feet tall. The surface of a barrel cactus is ribbed, with needles growing along the ribs. The crowns of barrel cacti produce flowers that are 1 1/2 to 2 1/2 inches in diameter, in shades of yellow or red. The cockscomb hedgehog cactus grows to approximately 20 inches tall. The surface of this cactus is ribbed, with needles arranged in small circular formations called areoles. Each areole has two to four needles, with one longer than the others. Cockscomb hedgehog cactus produces petaled blossoms in spring. The flowers are magenta in color with centers the color of dried hay. The strawberry hedgehog cactus grows in clumps of columns. These cacti are light green, and grow from 4 to 12 inches tall, with diameters of 2 to 4 inches. The cactus is covered in spines that are 2 to 3 inches long. During the spring, strawberry hedgehog produces bright pink flowers at the crown of its stems. The fishhook pincushion cactus is a small cactus that measures only 6 inches or less in height. The spines grow so thickly on the surface that it is difficult to see the green cactus underneath. 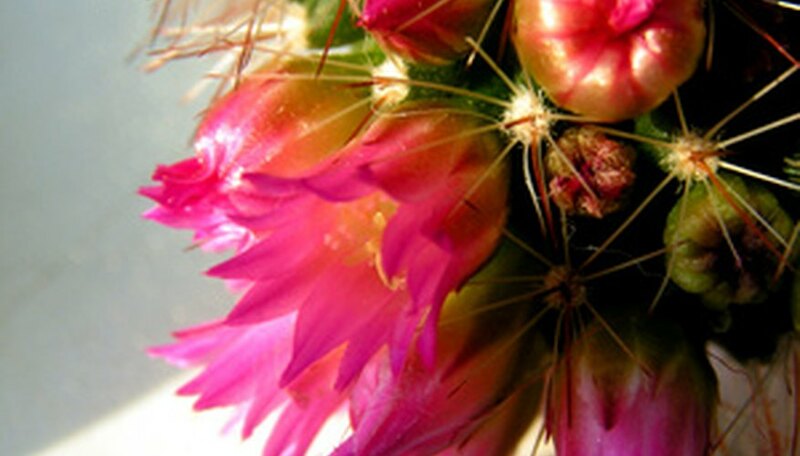 Approximately 5 days after the first rain of summer, this cactus produces bright pink flowers with yellow centers. Fishhook pincushion cacti produce two or three batches of flowers during the summer. In nature, this cactus uses other plants to protect it from harsh sun, wind and frost, so it is found under trees and large plants. Crimson hedgehog cacti are barrel-shaped plants that grow in groups of up to 100. The plant's stems grow up to 1 foot tall and 2 1/2 inches thick. The surface of the crimson hedgehog is ribbed, with spines on the ribs. The plant produces flowers that are deep crimson in color, with several petals that form a cup.